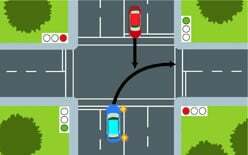 Let’s look at a number of examples of giving way which can help you determine what to do at many kinds of intersections in New Zealand (and around the world). 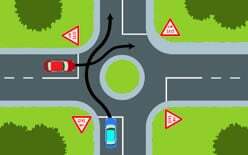 If you’ve been confused about the rules before, these simple examples will help you learn them easily. 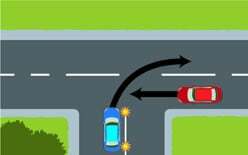 A police officer’s directions overrule any give way or stop signs. 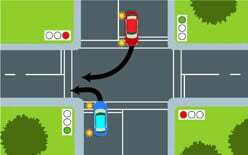 In all examples, let’s look at it from the point of view of you driving the blue car. You are turning out of an uncontrolled intersection and must give way to the red car coming from the right. 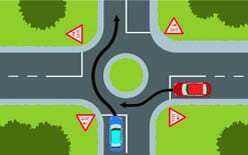 If this was a controlled intersection then you’d have to either stop at a stop sign or wait at a give way sign until it was safe to go. 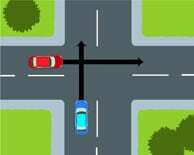 You are turning left and there’s a red car coming from your right along the road. You have to wait because you are on the bottom of the T.
This is a tricky one. 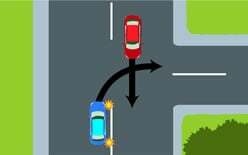 It’s an uncontrolled intersection and both of you are travelling straight ahead. 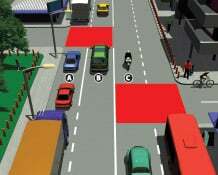 Who has to give way? 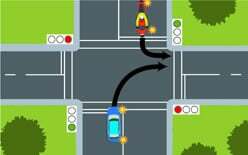 The rules are that you give way to the right when there are no other controls like a stop sign, therefore the red car must stop and wait for you. 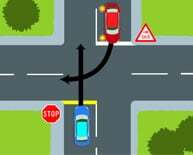 Remember our stop sign rule. 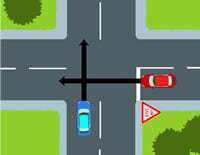 At an uncontrolled intersection or one where you were both waiting at a give way sign, you would have right of way. 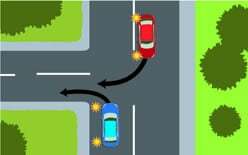 However, you are waiting at a stop sign and that means that the red car has priority, even though it’s turning across in front of you. 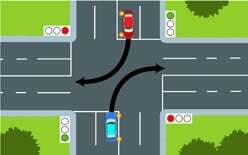 When both cars are turning right at an uncontrolled intersection (which includes many driveways and entrances to public car parks that don’t have markings), you must give way to vehicles on the straight road (i.e. the top of the T). 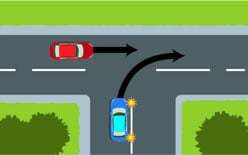 The blue car has right of way – the red car must wait for you to turn. 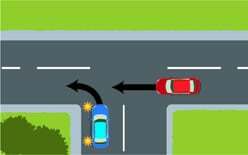 In this scenario neither car needs to cross each other’s path. Both are on a green light. 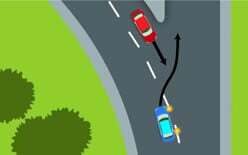 If this was an uncontrolled intersection this manoeuvre is actually safer when the cars pass behind one another rather than in front. 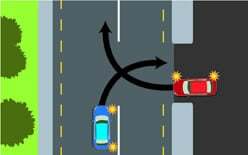 This is because when passing like in the diagram, your vision up the road to the left is obscured. 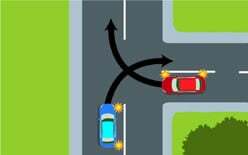 Both of you can complete your manoeuvre without interfering with each other’s trajectories. ‹ What vehicles can you drive on what class of licence in New Zealand? 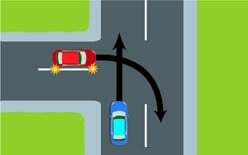 What vehicles can you drive on what class of licence in New Zealand?